No, not that Frozen, however this Frozen was also critically acclaimed, as one of the best Horror films of 2010. After seeing that it begs the question, were we watching the same movie? 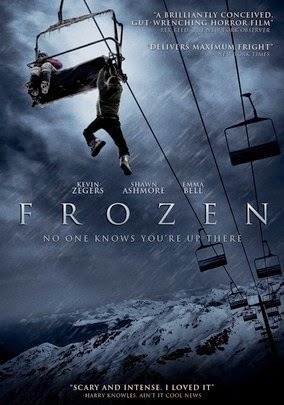 2010's Frozen takes place at a ski resort, where three very unlucky skiers are stranded on a chair lift. Somehow, none of the cameras picked them up and none of the employees at the ski resort realized there were people stuck on their insanely high chair lift. There really isn't a whole lot you can do in a setting like this, so pretty much everything you'd expect to happen, does happen, with little in between. The setting is creepy and I'm sure that getting stuck on a ski lift is someone's worst nightmare, but a whole film just based on that? After the character introductions, this film turns into an hour of talking, with the occasional really bad idea thrown in, and that's it. The Following's Shawn Ashmore stars and he was alright, it's really hard to judge a performance when all the people do is sit in a chair and talk. I honestly don't know what the critics liked about this film and what prompted them to give it such a high rating, because unless you like watching people sitting around in a chair and talking, this film really has nothing going for it. Frozen is painfully slow and worse than that, it's predictable. If I haven't learned by now to ignore my fellow critics and just watch the films that interest me, I probably never will, but please take it from me, Frozen is a film that you can absolutely do without.